LG Q6+, Q6 and Q6α announced with FullVision display and Qualcomm Snapdragon 435 processor. LG today announced that the LG Q6, part of its new Q series, will be the first smartphone to offer the FullVision display following the LG G6. 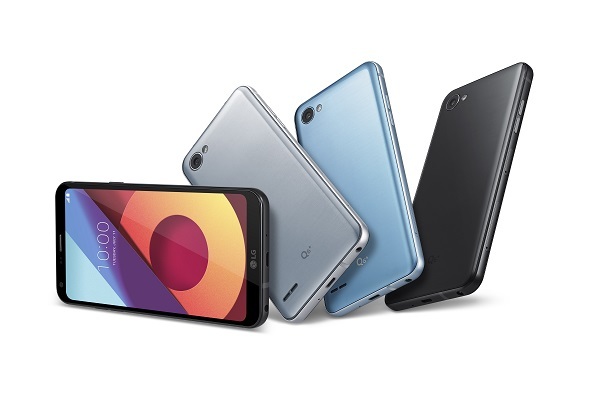 LG's Q series is the company's latest line of powerful, mid-range smartphones boasting the essential features of LG premium phones at exceptional price points. The Q6 family consists of the Q6+, Q6 and Q6α. As the first in the Q series to be announced, the LG Q6 features some of the most desired innovations from LG's premium G6 smartphone and packages them in a sleek, stunning body highlighted by its FullVision display with minimized bezels. The three variants cater to different user groups in terms of memory and storage: the Q6+ comes with 4GB of RAM and 64GB of ROM, the base Q6 delivers 3GB of RAM and 32GB of storage and the most affordably-priced Q6α comes with 2GB RAM and 16GB of ROM. At a time when minimized bezels are an emerging trend in premium smartphones, the Q6 is the first smartphone in the mid-price category to bring this feature to the masses. The unique 5.5-inch FHD+ FullVision display in the LG Q6 with its 18:9 aspect ratio makes video browsing, gaming and multi-tasking more immersive. The smartphone's "bezel-less" form factor was designed to maximize the screen while still preventing accidental touching of the screen when being held. And the LG Q6 looks good with its minimalist and sleek design. With no unsightly camera bump and sleek appearance, the Q6 features attractive curves with rounded corners of the body matching the corners of the display. Packaged in a stylish metallic frame, the Q6 manages to be both lightweight and sturdy for a more durable day-to-day usage experience. In another nod to user convenience, LG's proprietary Face Recognition feature allows owners to unlock the Q6 faster and with less hassle than other facial recognition technologies currently available. The Q6 smartphone incorporates a 100-degree wide angle selfie camera that allows shutterbugs to include a large group of friends and family in the shot without effort. The camera's improved LG UX 6.0 takes full advantage of the 18:9 aspect ratio of the FullVision display. Square Camera Mode makes it easy to "share your squares" or create photo collages using multiple square images. The LG Q6 is also quite durable. The metal frame surrounding the Q6 is constructed of ultra-strong 7000 series aluminum, one of the highest strength aluminum alloys available and used extensively in industries such as aerospace.